We do not know what will happen with the San Jose Sharks this offseason. Mostly because the team has taken quite some time from its season-ending loss at Los Angeles on Saturday to get to its Wednesday locker cleanout/breakout day. But we will get answers soon. 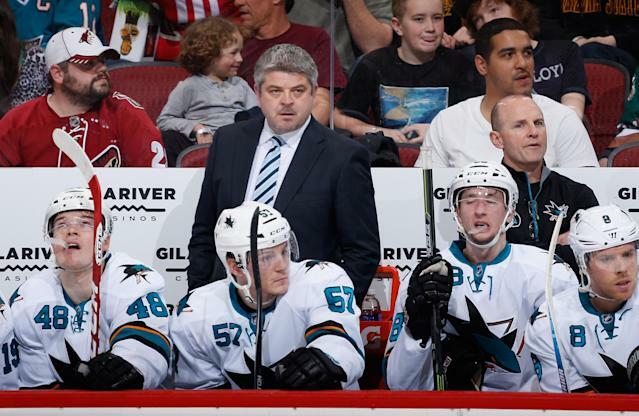 And they probably won’t be good for Sharks coach Todd McLellan. According to the San Jose Mercury News, expect some sort of parting of ways between the Sharks and McLellan. Not a firing, but something where the Sharks and their bench boss – who will almost definitely get another job this offseason – can go on their merry ways in different directions. The Sharks finished with 89 points and didn't make the playoffs for the first time in 10 seasons. McLellan has been San Jose's coach since the 2008-09 season. Signs indicate that a mutually agreed upon parting of the ways is more likely with both general manager Doug Wilson and McLellan acknowledging it is in everyone’s best interest for him to depart with one year left on his contract. But there is proverbial blood on someone’s hands. That would (again) be general manager Doug Wilson who took a team nearing the end of its competitive window and really … didn’t do much to make it better. Unless San Jose wins the draft lottery with its 5.0 percent chance. Here's another solid post-mortem from CSN Bay Area. Were the Sharks a contender this year? We will never know, just because the team itself didn’t really get better last offseason or during the season. Were the Sharks rebuilding? Were they going for it? Were they hoping to make the playoffs while rebuilding, hence the best of both worlds? If San Jose tried to do any of these, the Sharks management failed miserably. The moves during the season were minimal. The roster had an aging core – but one that was still effective with Joe Thornton and Patrick Marleau – and was left to founder with little support. The acquisition of defenseman Brenden Dillon from Dallas for blueliner Jason Demers doesn’t qualify as anything but a positional swap. Wilson pushed for Brent Burns to move from forward back to defense – where he flourished and was the team’s lone All-Star with 60 points. Last season, Wilson re-signed Thornton and Marleau to three-year extensions which kicked in this year with no-trade clauses. So now he’s basically stuck with them, because … he won’t ask them to waive the clauses? That’s bizarre, especially since the Sharks are rebuilding with younger players according to Wilson? Or refreshing? It feels like he's used too many different terms. The Wilson/Thornton dynamic was the one that really disrupted the season. It’s tough to say Wilson has treated Thornton poorly, since he did give his former captain a three-year extension worth $6.75 million per-year that goes into his late-30s. But since last offseason began after blowing a 3-0 first round lead to the Los Angeles Kings, Wilson has handled Thornton’s public image and reputation horribly. First there was the stripping Thornton of his captain’s ‘C’ last summer which was a slap in the face, regardless of how all sides didn’t seem to have a major problem with it at the time. It was a passive-aggressive public shaming of a player. Then there was the season ticket holder event in March where Wilson took a subtle dig at Thornton’s ability to handle the captaincy, to which Thornton then said his general manager needed to shut up. The Sharks had some good teams before Thornton. But he helped turn San Jose into a destination team and not just the nice little franchise with teal in Northern California. The Sharks had never won 50 games before Thornton’s arrival. They won over 50 or more four times after his trade to San Jose in the 2005-06 season. You don’t degrade your franchise savior publicly. A tumultuous off-season left (McLellan) with his biggest challenge in his time with the Sharks. Two key decisions — moving Brent Burns back to defense and stripping the captaincy from Joe Thornton — were pushed by Wilson, though the coach did sign off on each. On top of that, some players were unhappy with both the message from the general manager that he considered them a “tomorrow team” as well as his decision to publicly reveal statements they made privately questioning locker room bonds. It’s clear that Thornton, McLellan and Wilson can’t co-exist as a trio. This summer feels like The Gathering in the film “Highlander” where “there can be only one.” I’m now imagining Thornton, Wilson and McLellan having sword fights with cheesy 80s Queen playing in the background. With some of the right moves this offseason, this team can be competitive next year. Joe Pavelski is 30 and had 37 goals this past season. Thornton had 65 points and is still a puck possession monster leading the Sharks in shot attempts relative percentage according to the NHL’s enhanced stats website. Patrick Marleau has dropped off a bit, to where he had 57 points in 82 games, but he can at least provide something next year. He’s not going to fall completely and should at least provide about 50 points next year at worst. The problems with the Sharks are off the ice. The situation this year felt sabotaged. The Kings knew they had a team to make the playoffs and blew it. The Sharks knew they didn’t and the players – and probably the coaches – knew it wasn’t their fault. Maybe 20-year-old defenseman Mirco Mueller takes a step forward next year because of the experience he got this season. Tomas Hertl, 21, should be better than his 31 points and 13 goals in 82 games. Matt Nieto is just 22 and is another part of that Sharks' young core that’s decent. All these players were brought in by Wilson, and maybe their experience from this losing season will help. Last year I thought Barry Trotz got a raw deal from Nashville when David Poile didn’t renew Trotz’s contract. One year, Trotz somehow got 99 points out of a forward group led by Sergei Kostitsyn and Martin Erat. At the time it was a classic case of a coach being a fall guy and a GM trying to save his job by making a change. But really, everyone just needed different scenery. Trotz has maybe his best team ever in Washington, and the Predators nearly won the Central Division with Peter Laviolette at the coaching helm. A lot of the players Poile thought would eventually carry the team are making progress. It’s easy to forget that McLellan had some loaded rosters with the Sharks and never made it past a conference final. Maybe he needs a fresh start. But as of April 14, this year felt like an unnecessary soap opera. This organization no longer feels like hockey Xanadu. And Wednesday we’ll find out if anyone has anything profound to say about how or why this year turned out the way it did and how it can get better. The Sharks aren’t that far off. They just need to limit the focus to what they can do on the ice.